What are pirates without the Caribbean? And what is the Caribbean without Voodoo? Okay! I know there were many pirates throughout the world besides in the Caribbean, but hey, I’m not worried about those pirates. We’re talking about the Caribbean! And the Caribbean needs Voodoo! 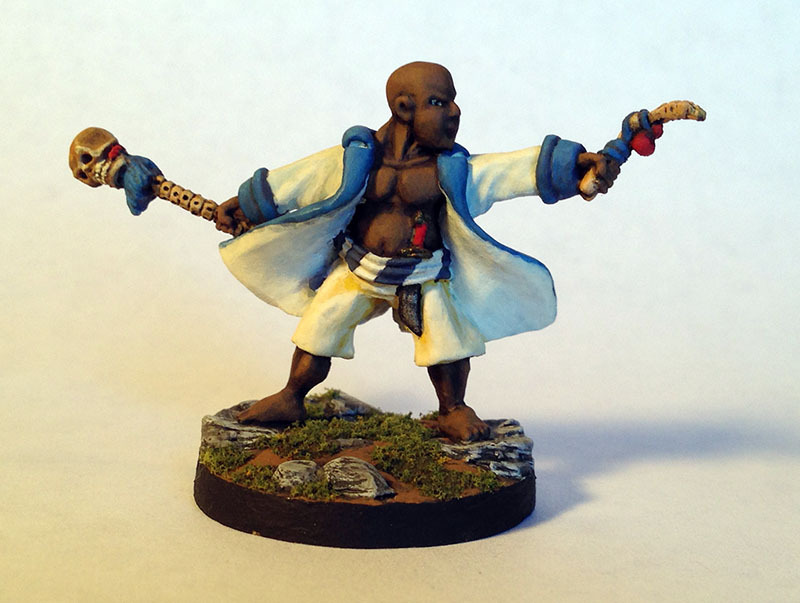 I finally finished painting my Carib Voodoo Priestess (Mambo) from Reaper Miniatures. She is ready to join the rest of the tribe. On to the rules… The Voodoo rules are written to compliment Fear and Faith by Ganesha Games. They are based on many sources including various SOBH books, movies, and books and are largely a Hollywood fanciful version of Voodoo. They seem to work okay for me. Try them out and let me know how they work for you. Suggestions are are always welcome! Watch out for the zombies! They bite! Here’s Elijah l’stran my Bokor and resident Voodoo expert. Kind of Woefully Fat -ish I think. This entry was posted in Uncategorized by CaptainRumm. Bookmark the permalink.